Recently, we had the opportunity to help kids get ready to go back to school through an event held at New Heights church in Owasso, OK. 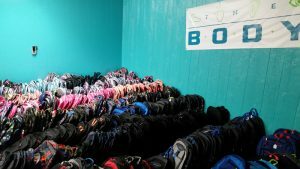 It was an all-day event called the Back to School Mission and here are the results. The families came from Tulsa, Owasso, Collinsville, Claremore and Skiatook to name a few of the towns and cities. With such amazing results, what do you think is the size of New Height’s congregation? 200, 500, 1000? Would you believe the size of the congregation is about 80 (including children)? About 35 of the members volunteered for the event. Further, 90% of the funds for this event come from the church members. Little outside money is used. What are some small business owner takeaways from this story? Even a relatively small group can accomplish great things with knowledge, expertise and a common vision, mission and passion. In this case, the mission of New Heights church is “to be the hands and feet of Jesus in our community as we grow in faith, hope and love”. The event took a great deal of expertise in planning, coordination and execution. Of course not every single detail went to plan. For those few items, flexibility and quick decision making were required. These folks did not just talk about doing something great, they DID IT. How many great ideas have you had that never made it to planning and execution? How did you know it was a great idea? Many of the volunteers for the event have jobs or are owners of businesses. They took a little time away to help get needy children ready for school. We encourage all businesses owners and leaders to find a way to spend some of your time, energy and profits to help people in need and help better the community.